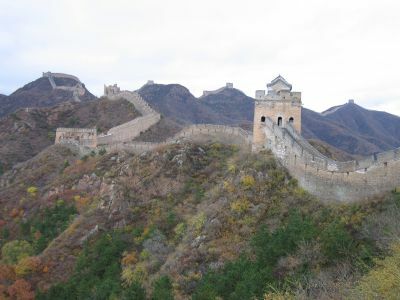 the first glimpse i got of the great wall of china was during the last 2 hours of my journey on the trans-siberian railway - a journey which began in moscow. i poked my head out the window when all my fellow passengers started oohing and aahing, and there it was...4 days later i'd be walking on it, an experience captured by the next 13 pictures. 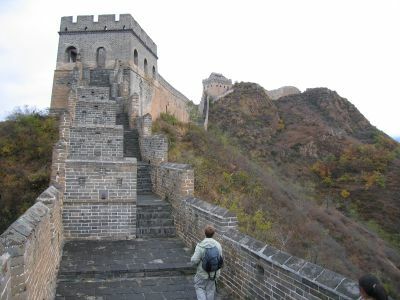 i walked a 10 kilometer section of the wall that most tourists don't. 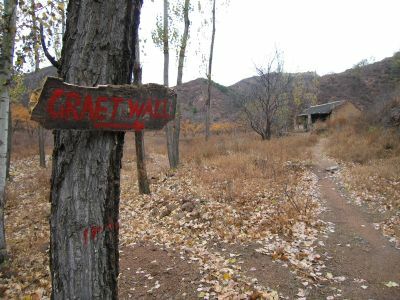 we were dropped off by a van in a small village and then walked through 3 kilometers of hilly terrain, following a path and the occasional sign up into the hills to the "graet wall" of china. look closely at the sign. 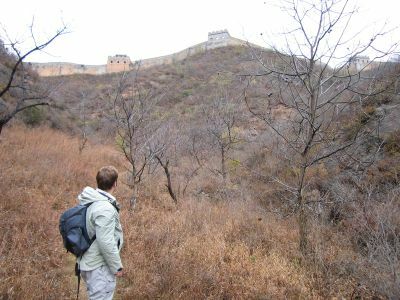 ben from england, one of my walking partners, stops to take in our first view of the wall. 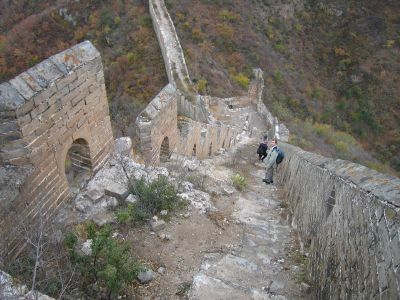 around the bend we climbed a steep hill and then entered the wall through a gate. 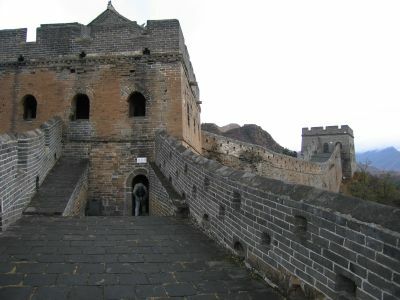 hundreds of towers were built along the wall as shelter and lookout points for the guards. we were able to walk the stairs to the top for better views. 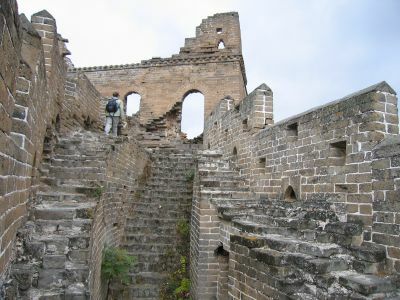 sometimes the climbs to the towers were so steep they built stairs. ben prepares to do some climbing. 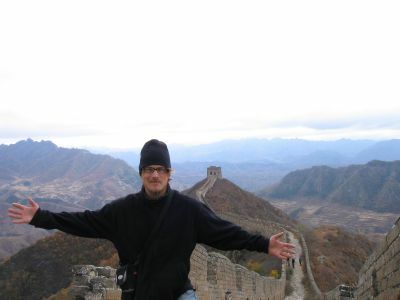 you can see the wall is always on the crest of the mountain. 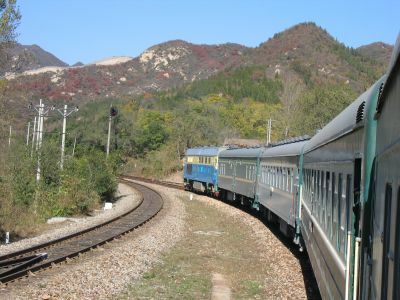 it just goes and goes, running up the spine of the rolling mountains across northern china, providing a barrier between china and mongolia. 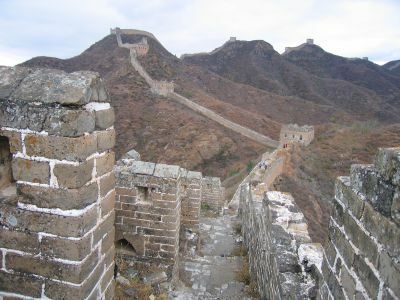 some sections of the wall are crumbling. you know, it's pretty old and doesn't really need to be maintained now that chinggis (genghis) khan isn't running things anymore up there in mongolia. unfortunately the day wasn't so nice, pretty overcast and chilly, so my pictures aren't great, but i did what i could. the land around was pretty drab too from the cold temperatures. this is in october 2004, by the way. in summer the surrounding land is vibrant green, but also stifling hot for a 13 kilometer walk. 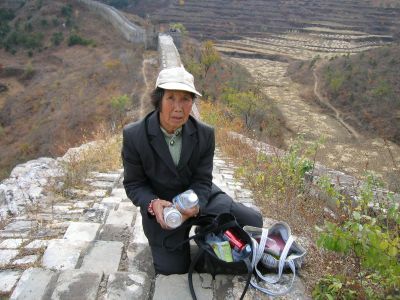 the great wall of china makes one hell of a picnic spot. as i said, some sections are steep and in bad shape, so here ben turns around to make sure i'm not coming down the steps on my face since i continually had a camera attached to my eye. 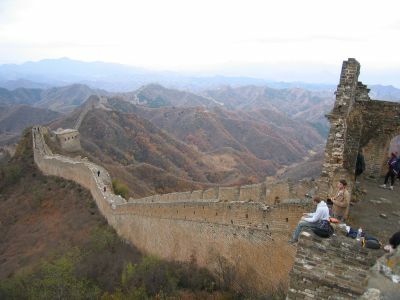 life's to do list item #3: walk the great wall of china - CHECK. 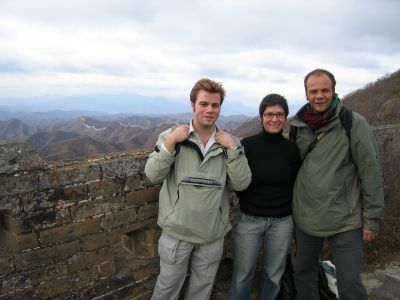 here are my walking companions from the far east asia hostel in beijing: from the left, ben from england, tracey from australia, and pierre from france. no i don't want to buy a beer. it's 11 in the morning, i'm hungover, and i just walked 13 kilometers. no, no. no, no, no. no thanks. no thank you. no, no, no. no. no, i don't want a beer. no, no really, thanks. no, no, no. no, thanks. no, thank you though. no, no, no. nope. nah, no thank you. nope. nah, nah, nope, no. that's pretty much how my conversation with this aggressive lady went.